Physicists Dr Aditya Sadhanala and Darshana Joshi, together with colleagues Shruti Sharma (Stony Brook University, New York) and Dr Vijay Venugopalan (Marie Curie ITN Fellow, DESTINY, Politechnico Di Mailan) have returned from a month-long, 10,000 mile tour of India during which they brought hands-on science from Cambridge’s laboratories to 5,000 students. The team reached out to teenagers from a wide range of backgrounds in cities, towns and villages in some of the remotest parts of rural India. The tour was part of VIGYANshaala (‘the classroom of science’ in Sanskrit/Hindi), which encourages Indian graduate students and researchers around the world to collaborate with academics, teachers and students in India. The programme aims to establish a mentoring network committed to communicating research and inspiring others. 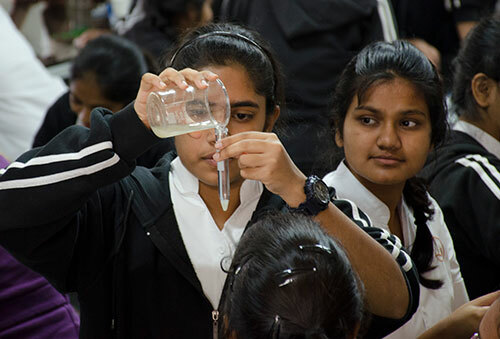 Though science lessons are compulsory in India, few pupils get to undertake hands-on experiments. The Cambridge academics believe this is vital in inspiring them to take up STEM subjects at an undergraduate and postgraduate level. Darshana explains: "Born into a lower middle class family and a first generation learner, I wanted to be a scientist from an early age. “The only role model children in my generation often came across on TV was Kalpana Chawla, a NASA astronaut. Aditya adds: “Our main motivation is to expose people to that kind of science I never had when I was growing up”. Both Aditya and Darshana have been mentors and outreach volunteers at the Cavendish Laboratory, as part of the Physics at Work programme, which formed the inspiration for VIGYANshaala. Darshana, who is also the President of Cambridge Graduate Union, says: “After starting a PhD at Cambridge, I took part in various outreach activities including the Cambridge Science Festival, which prompted me to start similar activities back home. “I wanted to expose Indian students to exciting science and engineering at an early age and show them role models in action. The programme confronts a number of challenges facing young people in many parts of India, one of the most serious being a lack of exposure to the latest scientific and industrial research, as well as familial and societal resistance to the idea of young people pursuing a scientific career. This resistance is particularly acute for female students and VIGYANshaala is determined to change that. The team’s strategy is simple – to make science fun for young people and emphasise its impact on daily lives by offering hands-on workshops with experts from a wide variety of STEM fields. The team’s ambitious long-term aim is to bridge the gaps between academia, government and industries and be a catalyst for changing the climate of science education in India. Supported by the Materials Research Society the volunteers delivered day-long workshops under the banner “It’s a MATERIALS world”. The programme included demonstrations of flexible optoelectronics and solar technologies, polymers and gels, Graphene, and hands-on activities like DNA extraction from bananas. 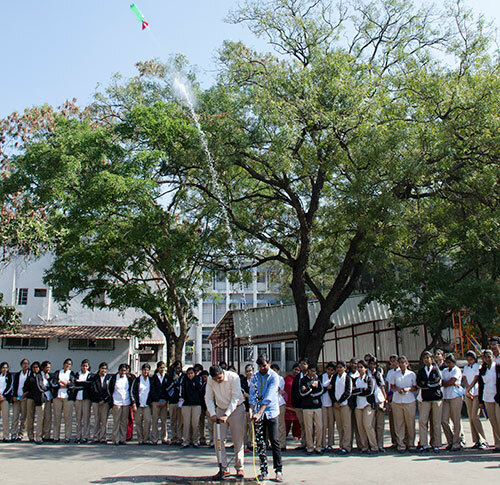 The season began in Navi Mumbai, followed by two workshops in Pune targeting high-school and undergraduate students separately. In the North, they visited the Purkal Youth Development Society Learning Academy which serves 400 students from disadvantaged families from the foothills of Musoorie. In Haridwar, the team ran a workshop at the Gurukul Kangari University Physics department for 150 students, mostly from Hindi Medium Government Schools. In the remote town of Forbesganj on the border with Nepal, Nimisha Kumari, a PhD student at Cambridge’s Institute of Asronomy, along with team VIGYANshaala organised two workshops, including one dedicated to female students. Nimisha says: "Although I always aspired to be an astronomer, I did not get a chance to see even an amateur telescope until I finished my bachelor’s degree. I believe children should have such exposures early in their lives so that they can understand their passion and make informed career decisions. The team also delivered a two day science camp for 150 orphaned children aged from 13 to 18 under the protection of Udayan Care, a Delhi based NGO which also supported Darshana’s education from high school through to Cambridge. Turning their attention to the south, the team was hosted by the Institute of Mathematical Sciences in Chennai and the Tamilnadu Science Forum. During their four day roadshow they were visited by a socially marginalised community of Adi Dravidars, some children with learning disabilities and others whose parents have leprosy. “Observing you and realising that women like you really do make a difference has left an imprint on me that will last throughout my life – do keep inspiring,” said one. The team is hoping to tour again in the future, drawing on the network of PhD students in India, to help reach thousands more children across the country bringing the wonders of “magical science” to new generations. Other plans include collaborating with Science Resources Africa to conduct teacher training workshops and running “It’s a MATERIALS world” workshops in Sierra Leone.